Dancers from The Winston Churchill School were invited to perform at Dance Woking’s Winter Shorts programme at the Rhoda McGaw Theatre last week. The schools KS3 Dance Club were given the opportunity to take part in the Young DanceMakers Platform, on Wednesday 20th November, sponsored by Sportivate, a 6 week dance project, allowing schools to work with Dance Woking and to provide platforms for schools to enable them to share their work as well as to gain experience of presenting it in a live theatre environment. The Young DanceMakers were encouraged to choreograph their own dance through peer to peer support and by working with Dance Woking professional dance artists. This is the second year that we have been given this opportunity. On Saturday it was the turn of the G&T Dance Cohort. They were invited to take part at Dance Woking’s Community Platform Innovate. Sixteen dance groups took part and the audience were wowed with some amazing, exciting and electrifying performances. Our girls ‘did us proud’!! Their sensitive interpretation of Matt Walker’s choreography ‘Reflection’ was sublime and their musicality and focus was touching; showing a maturity of movement beyond their years. Their journey so far has been amazing and the dancers continue to grow and benefit from the G&T Dance programme taught by Matt. On a cold Friday afternoon 13 of our Sports Leaders from Y9 & 10 travelled to Goldsworth Park to help lead and referee the first primary schools’ Hockey Coaching Festival for our new partnership. 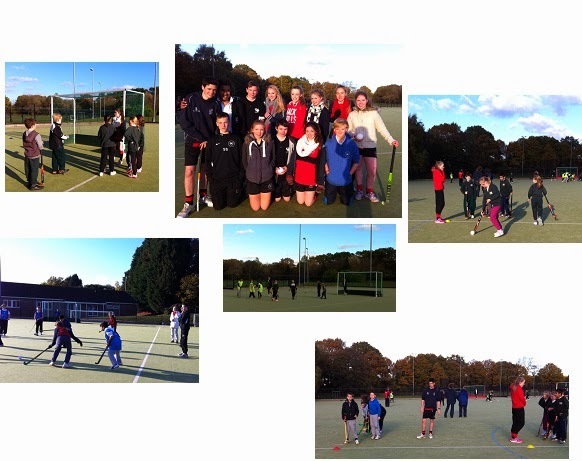 The students helped the Woking Hockey Club coaches lead Y5 & 6 pupils from The Hermitage, Goldsworth, Knaphill and St Johns primary schools in an afternoon of hockey drills and skills. These skills were then developed in a mini tournament where each school played each other in small teams of 6. Our students either took charge of a team or refereed the games. Many of the male members of staff around the school are growing rather handsome moustaches in aid of prostate cancer and cancer research during the month of ‘Movember’. Mr Reed did a fantastic job on Thursday at the past students' awards evening by collecting on the door and raised £30 for us already. 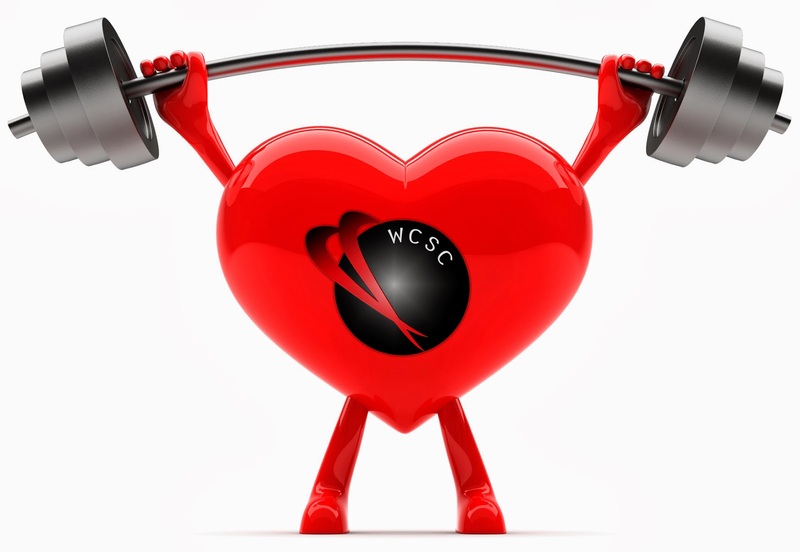 Thank you all for your support, we know there are a lot of charity events going on at the moment but your donations will be much appreciated! Past Students Celebrate Best Ever Exam Results! On Thursday 14th November students returned to the school to receive their exam certificates from the record breaking results this year. Mr Barter, Chair of Governors, welcomed the students, their parents, school staff and our special guests the Mayor of Woking, Cllr Anne Roberts, and Mr David Smith, former Headteacher at the school to mark their fantastic achievements. Year 11 student, Leon Tolkovsky, entertained all those present with an excellent rendition of Nocturne op.9 no. 2 by Chopin. The vote of thanks was provided by our current Head Girl and Head Boy, Lily Bohling and Harry Moore, who thanked all those who had organised this very successful evening and wished all the students well for the future. Special Award winners were George Pennistone, The Owen Davis Award, and Eloise Garbutt, The Edward Vines Trophy. Winston students have worked in partnership with Impero to develop a keyword detection library as part of its network management software solution, Impero Education Pro. Students trained as cyberbullying mentors, by the charity Beat Bullying, gave up their time to work with Impero to create a list of keywords and phrases most likely to be used to facilitate bullying online. The list of keywords and phrases formulated by the group of cyberbullying mentors has been used to assist Impero’s research into e-safety development, enabling the software company to develop an extensive keyword detection library. The students, who ranged from 11-16 in age, were able to provide a vivid insight into commonly used text speak, jargon and slang terms, of which Impero was previously unaware. Keywords and phrases which the mentors believed victims may use in retaliation to cyberbulling were also considered. The new addition, which falls under Impero’s e-safety feature, consists of various keywords, phrases and acronyms most likely to suggest bullying behaviour. A glossary providing a definition of each term ensures educational staff understand the nature of a potential violation when these keywords are typed by a student, then captured and highlighted by the software. A new ‘confide’ button has also been developed, which will enable students to confidentially raise a bullying concern, anonymously, with a member of a staff. Although it is important to embrace the opportunities technology in education can afford, it is equally vital to ensure students behave appropriately and remain safe in the digital classroom. Impero believed it was important to gain an insight from young people who possess experience of the effects of online bullying, both first-hand and from an advisory perspective. This information has provided invaluable research into the development of the detection library, which will now highlight hundreds of keywords and phrases related to online bullying. The collaboration between Impero and the cyberbullying mentors from The Winston Churchill School has supplied a wealth of knowledge to proactively combat the issue of cyberbullying. The student cyberbullying mentors are proactively helping young people to remain safe in the digital world throughout schools nationwide. Our Year 11 girls were provided with an amazing opportunity last night at Harlequins Rugby Club. Issy Fisher, Evie Laidlaw, Jess Emerson, Libby Warn, Molly Jarrett, Anna Major, Laura Coxon and Tara McCarthy played touch rugby during the half time interval in the international game between England Women and Canada. The Students did Winston proud as they beat their opponents 2 tries to nil with Issy Fisher storming through the opposition defence to score after a 20m dash. The other try was scored by Laura Coxon after displaying some nifty footwork! Well done to all the girls who took part, it was an extremely enjoyable experience for all! 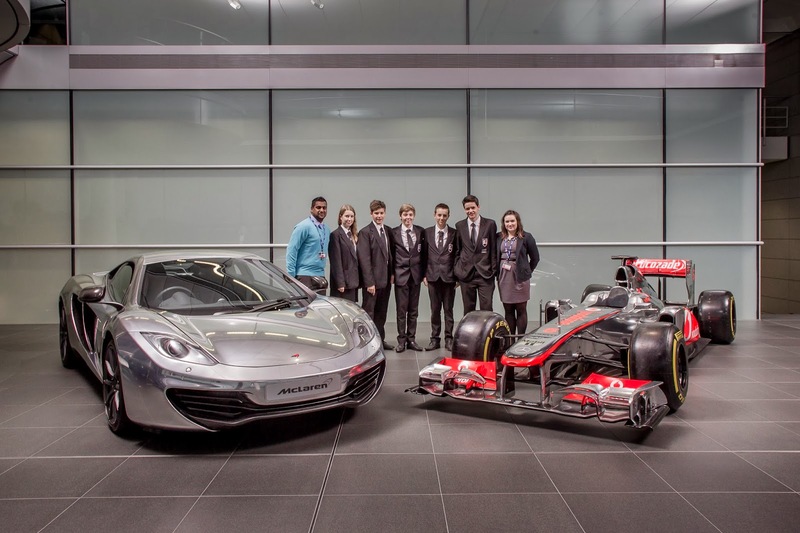 Winston Churchill School Technology Students Race to McLaren! 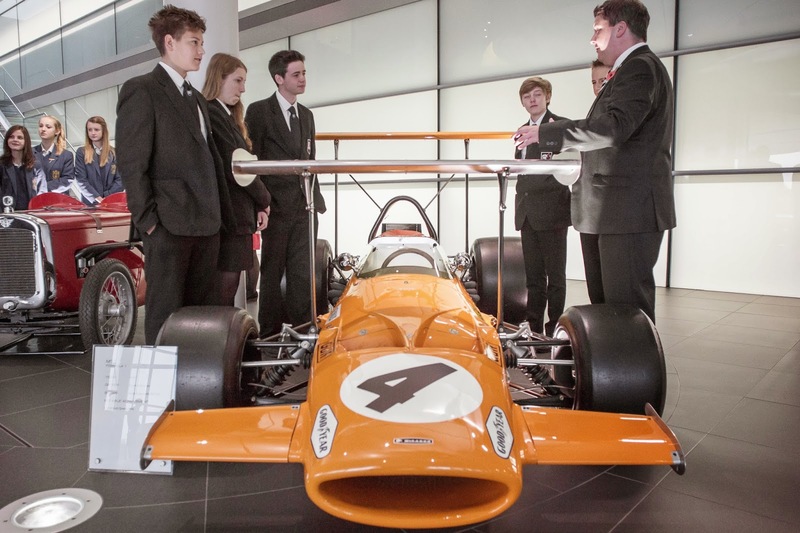 On Friday 8th November I was delighted to take five gifted and talented year 10 Resistant Materials students to the McLaren Technology Centre. The visit was months in the planning with Daniel Bowman, Tim Clarke, Jamie Edey, Joanna Rotherham and Ethan White designing and making a car with no engine that would travel 10 metres across part of the McLaren Centre. Even though the elastic band propelled car did not receive the title as fastest it would certainly come first place for style and such is the passion of the team they are already hatching their plan to win next year's competition. 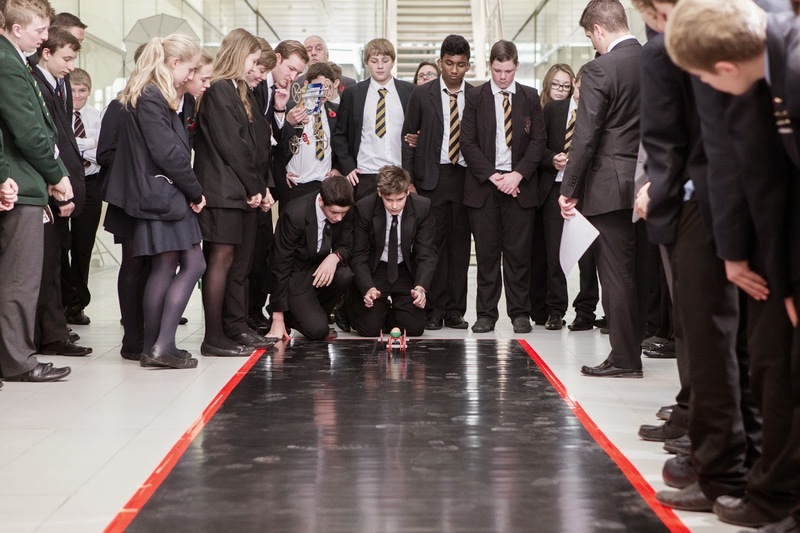 Before the big race the students gained rare insight as to what goes on inside the technology centre, meeting the designers and engineers that create the cars we see Jenson Button and Sergio Perez race. They were lucky enough to get up close to the brand new McLaren P1’s hot off the production line and past formula one cars, as well as the extremely impressive trophy collection. Bring on next year for the win! As well as inspiring more mechanical engineers and designers of the future. 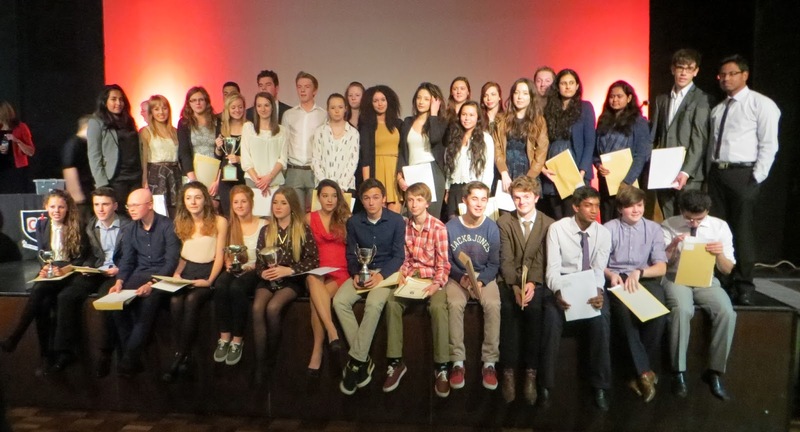 The fifth annual Sports Awards evening took place on Wednesday 23rd October. Our gifted and talented PE students and their parents were invited to celebrate their sporting achievements both in and out of school over the last year. Guest speaker Christian Malcolm, London 2012 British 200m and 4 x 100m relay runner, presented the awards and gave an inspirational talk to all those present. Mrs Johnston-Walker, Headteacher, who attended this event for the first time said "'This was an inspirational evening, celebrating outstanding performance, which reflects in equal measure the academic success of the students at Winston, sport underpins their motivation, confidence and drive to succeed".